Oh, and you can watch the video from CBS Sunday Morning here. I just happened upon this video, which is a great introduction to shopping at Mood for those who have never been. Check it out! This is a current exhibit at the Museum at FIT. Click through the link for hours. Also note, this exhibit ends soon (April 19)! 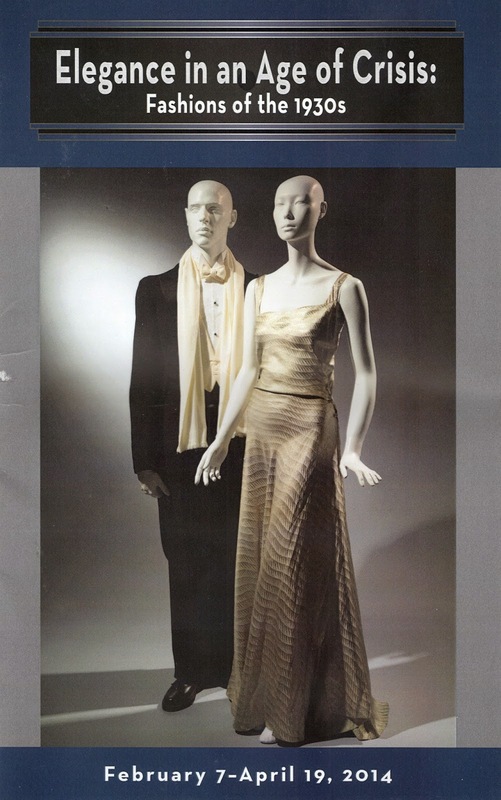 Fred Astaire's custom shoes, the lovely draped geometry of Vionnet, lovely suits, a sweet and lovely hand knitted sweater... beauty at every turn. They even took the time to show a woman's garment that is beautifully menswear inspired, despite its technical flaws. I am so impressed that its value in this exhibit could be appreciated anyway! Trust me on this one. It is powerful food for thought, particularly in the current US economy, with some historical perspective. Fashion Institute of Technology has done it again! Nestled behind "Trend-ology", which I featured on this blog in January of this year, is another smart, great, culturally relevant, fun exhibit. This biker jacket exhibit is a small but worthy one, exploring an iconic type of garment in a new, highly aesthetic and practical way. 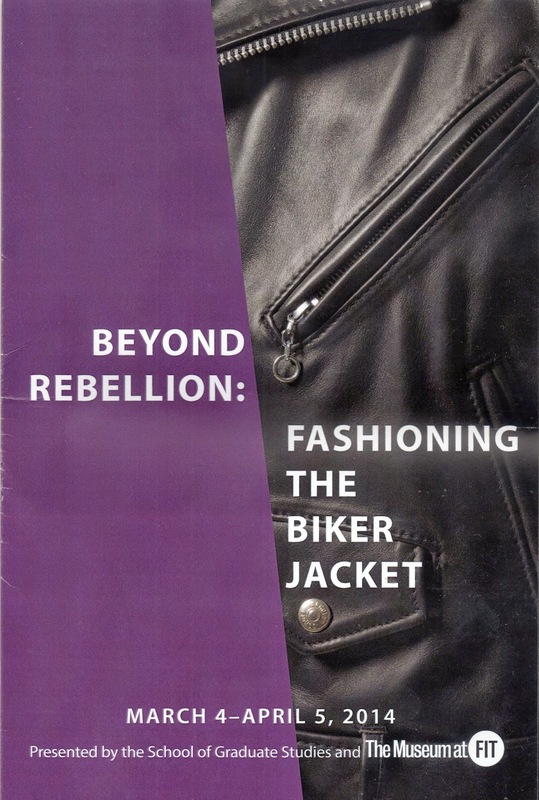 What I studied specifically and appreciated about this exhibit, was the technical sketch of the standard biker jacket, its features, and the descriptions of how and why a prototypical biker jacket is designed in such a specific way. Who knew the epaulettes were for holding gloves? I never considered the assymmetric zipper to be a factor for improving wind resistance, and... assuming you might actually mount a bike wearing one, that jacket needs to be short, needs to have a belt, and those pockets need to zip! There are also some lovely designer examples to see on display, all worth examining for features and details. It is a bit-size dose of an education on the biker jacket... and when you're done... head downstairs for another great exhibit. See my next post for more! Coming to the Garment District? Don't know where to go? Walking along 40th Street between 7th and 8th Avenues, I recently noticed how the food establishments are absolutely TAKING over the block. You can't walk more than ten steps without stumbling across another place to grab a bite. I ask myself... seriously, how hungry are we? And more importantly, what are we truly hungry for? Faster than I could blink an eye, walking between the same two avenues a while later on 37th Street, I noticed how many storefronts are empty or undergoing renovation. Visiting some of the vendors I have been patronizing for decades now, I can see that only the best can stay afloat these days. Beautiful products abound, and I will continue my mission to help you find them. The irony of it all is, I have never seen such a gorgeous array of options... but you have to know where to go, or you will exhaust yourself and your wallet with endless searching. More than ever now, you've got to look "up" to find more places to go! The weather is changing, Spring is in the air... can you feel it? And, like the wings of a hummingbird, my machine is humming again. I now offer the Speakeasy map to anyone who wishes to purchase one. (Follow the link, for more info) Complete with names, addresses and special offerings from my go-to sources of sewing-related products and services, this map will help you narrow down your choices to something more manageable and specific to your needs. Constantly being updated to include my newest finds, this map will help you find special spots of your own. You may also opt to join me on a future Speakeasy tour, request a private tour, or just contact me for information specific to your own needs. I'll be happy to help. Will there be more Speakeasies? Yes, you can bet your sweet patooties there will be... Schedule to follow soon!